Kozhi Nirachathu(Stuffed Chicken) and Aadu Nirachathu(Stuffed Goat) are two popular dishes among Malabar muslims, which they usually serve on festive occasions.I’ve heard a lot about these dishes from my relatives in Calicut,but didn’t get a chance to taste it from Malabar yet.After seeing the recipe posted by our dear Malabar girl ,I couldn’t resist preparing it and I must say this is a perfect dish for a Mallu style Thanksgiving feast,tastes great with white rice/roti. 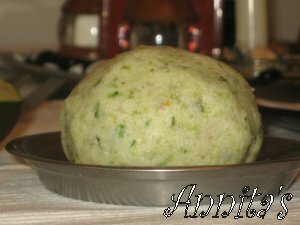 All the credit of this recipe goes to Mallugirl of Malabar Spices and Simi of Cooking with Simi.This is how I made it…. Skin the chicken and clean it thoroughly.Make tiny slits on the chicken both inside and outside, for the masala to penetrate well.Now apply a dash of lemon juice all over the chicken, to remove any unwanted smell.Rinse again in cold water and keep it aside.Prepare a marinade using red chilly powder,turmeric powder and salt adding necessary water to make a smooth paste.Apply the paste all over the chicken both inside and outside.Cover it well and refrigerate it overnight or for atleast 2 hrs. Boil the eggs till it is fully cooked.When hard boiling the eggs ,always use eggs at room temperature and also add a little salt in the water,this will somewhat prevent sticking of the eggs to the shells.When the eggs are done ,immediately transfer the eggs into a bowl of cold water and allow it to cool.When it is cold peel off the shell and reserve. Heat oil in a pan and saute onions,curry leaves,green chillies and ginger-garlic paste until onion turns translucent.Add the spice powders (for stuffing) and fry it in medium heat for 2 -3 mts or until everything is blended together.Add salt and the rest of the ingredients for stuffing and mix together.Finally add the boiled egg (whole or sliced half),and fry for few more minutes.Switch off the heat and keep this aside. First push the eggs into the cavity and then the onions,be careful not to overstuff.Now using a kitchen twine tie together chickens legs first ,and then the hands. Heat a big pan,big enough to fit the chicken and add oil into it.You may need 1/4th -1/3rd cup of oil for it.Place the chicken gently into the pan . Fry the chicken,until all the four sides are lightly browned,and not fully fried.You have to turn the chicken as and when needed. Drain the chicken and keep it aside. Arrange the chicken in the middle of a baking dish with breast side down.If you’re using veggies add those around the chicken. Grind aniseed into a fine powder and mix together with all the other spice powders(for the gravy).Now to the same pan in which the chicken is fried(add more oil if needed),add onions,curry leaves,coriander leaves and chillies and saute them until onion starts to turn brown.Add ginger-garlic paste ,stir well,thrown in tomatoes and fry in a medium heat until everything is blended well.Add the spice powders and fry them until it starts to spread a nice aroma.Add the salt and mix together. 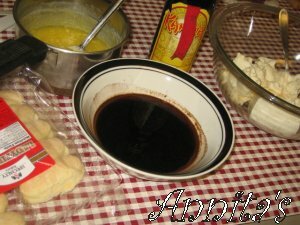 When the initial baking is done,take it out and pour the gray all over the chicken such that it is fully covered in the sauce. Bake the chicken for 45 more minutes uncovered,checking in between.When the chicken is well done and the onions are fully caramelised,take it out of the oven,cool ,remove the twine and carve. 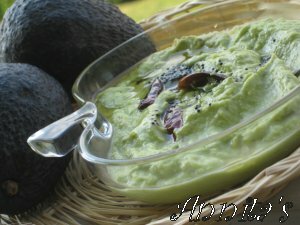 Avocado,otherwise known as butter fruit/butter pear is a tropical fruit which has a rich nutty flavor with high fat content,mostly health promoting monosaturated fat.Studies shows that Avocados are a good source of potassium ,fiber and vitamins.It is also good for heart health and fighting against cancers. 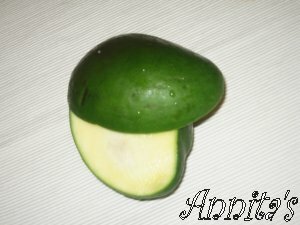 Because of its high nutritional value,i’ve started including this fruit also in our diet.So far i’ve tried avocado chappathi,milkshake,chutney and guacamole,and i’m still on the look out for more avocado recipes.I’ve also heard that a ripe avocado tastes good with some sugar sprinkled on it,haven’t tried it though. 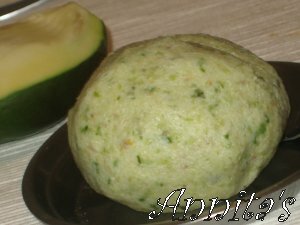 Avocado is usually eaten when its ripe.The skin of the avocado will turn from green to dark purple as it ripes.If you are buying raw ones,keep it in the room temperature for 2-3 days or until it turns dark,be careful not to over ripe it.To prepare the avocado,make a cut half lengthwise and gently twist the two halves.Now use a spoon/knife to remove the seed and then scoop the flesh from it.It’ll come out easily just like butter. Grind all the above ingredients together into a smooth paste adding necessary water. Heat oil in a pan and pop mustard seeds.Throw in shallots,following by red chillies and curry leaves.Fry until shallots turn brown.Add the ground ingredients,mix together and heat for a few minutes.Do not boil.Serve with dosa/idly. 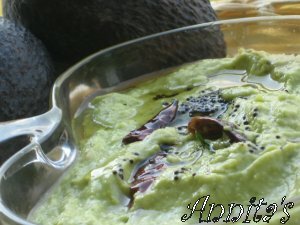 Note :-This chutney is not good for storing as avocados turn black as it stands.To prevent this darkening of avocados for sometime,drizzle it with lime/lemon juice. 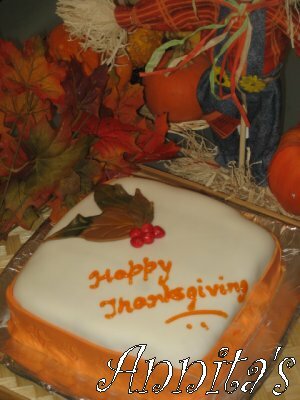 Wishing you all a very Happy Thanksgiving…!!! This is a dark chococlate cake prepared in microwave frosted with cream cheese frosting and coverd with marshmewllow fondant.I’ll be posting the recipe of the cake soon. Tiramisu meaning ‘pick-me -up’ is a classic coffee flavored Italian dessert prepared with mascarpone cheese,espresso and ladyfingers.It has become very popular recently and is served in almost every Italian restaurants. You either love it or hate it,there’s no middle ground.. This was my second attempt to prepare Tiramisu,first time I completely messed it up.This time I followed Olive Garden’s recipe as per Shn’s suggestion and it came out perfect.Thanks Shn. 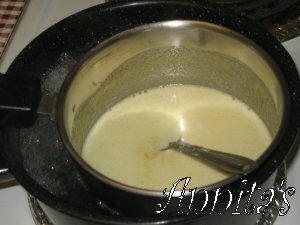 Fill half of a medium sized sauce pan with water and allow it to boil.In a metal bowl whisk egg yolks,milk and sugar together.Simmer the boiling water and place the metal bowl on top of the sauce pan and stir the mixture often for 10-15 mts.You can also use double boiler instead of doing this.When the sugar dissolves,the egg mixture will begin to thicken.Remove from the sauce pan and allow it to cool. Combine mascarpone cheese,cream cheese and vanilla extract together using an electric mixture.You’ve to mix it until it turns almost creamy with small chunks remaining.Add egg yolk mixture to the cheese mixture and combine them together. Combine 1/4 cup cooled espresso and 1/4 cup Kahlua together. Pour espresso-Kahlua mix into a flat plate so that it’ll be easy to dip the ladyfingers.Keep it aside.Dip each ladyfingers into the espresso-Kahlua mix and arrange it in a serving dish side by side.Ladyfingers will get soaked up very fast ,but we dont want to soak an entire ladyfinger.Dip only the bottom half of the ladyfinger ,the top half has to be dry.You can break the ladyfingers to fit into the dish. 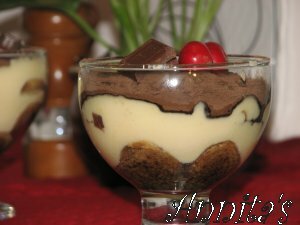 Spoon half of the mascarpone cheese mixture over the ladys fingers.Sprinkle grated chocolate/cocoa powder over it. 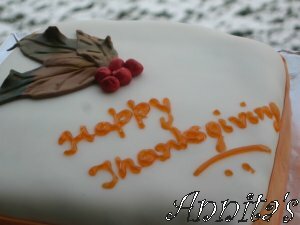 (I’ve used both chocolate and cocoa powder.Use it according to your choice. 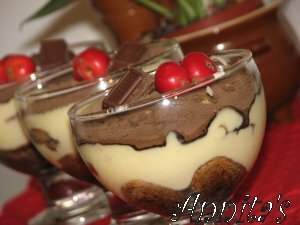 )Again arrange another layer of soaked ladyfingers over the cocoa/chocolate powder.Spoon remaining cheese mixture over ladyfingers and spread it evenly. 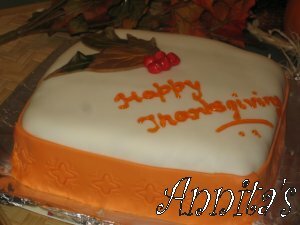 Cover and chill it for 8-10 hrs.Before serving sprinkle grated chocolate/cocoa powder over it.Cut into equal size square pieces and serve. 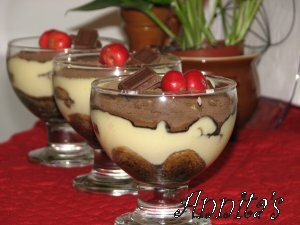 Note :- You can also prepare Tiramisu in dessert glasses/parfait glasses,so you can serve it right then and also you can save the extra time it takes to cut into desired shape. Info:-I’ve read here that mascarpone cheese is available in Fiorano Restorante in Bangalore.I dont know about other cities.Also if anyone knows about the availability of ladyfingers in India,can you please let me know about it? 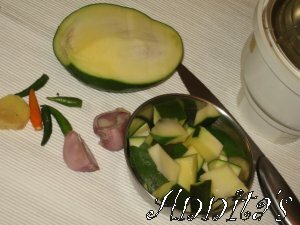 This is a quick dish prepared with sour green mangoes,the more sour the best.I love to have this for dinner along with Kanji(rice gruel) and pappadam. Grind all the ingredients together in a wet grinder/small jar in the Indian mixer.If your mangoes are not sour enough add 1 tsp vinegar/lime juice while grinding.